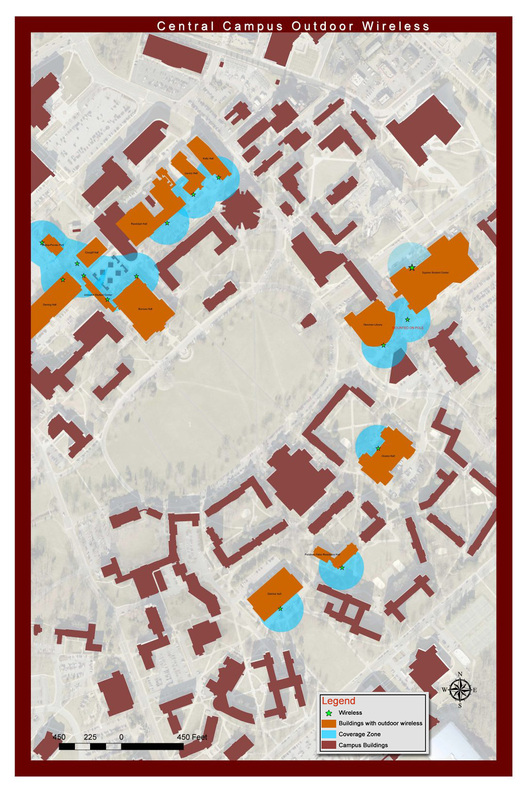 To enable learning and collaboration outside the classroom, outdoor wireless coverage has been added outside of Newman Library, Squires Student Center, G. Burke Johnston Student Center, and the following dining, residential, and academic buildings across campus: Burruss, Dietrick, Owens, Derring, Randolph, Bishop-Favrao, Peddrew-Yates, Pritchard, Lavery, Kelly, Cowgill, and the Virginia-Maryland College of Veterinary Medicine. These outdoor Wi-Fi installations have been made possible through funding support from the Hokie Family Annual Fund. With its support, Network Infrastructure and Services (a unit of the Division of Information Technology) has been enabling high-performance outdoor wireless that allows students, facilty, and visitors more flexibility when connecting to Virginia Tech's robust data network. Wi-Fi signal coverage has been expanded in high-traffic areas and spaces where people gather. The Virginia Tech Beyond Boundaries initiative calls for reimagining and reorganizing physical spaces on campus to foster engagement, interaction, and collaboration in more meaningful ways outside the traditional classroom. Sometimes, these types of changes are immediately visible, like the built-in benches beside Derring Hall, or the solar-powered charging station and table between Peddrew-Yates and Pritchard. But some changes, like these Wi-Fi expansions, aren't immediately apparent. More outdoor spaces will be covered as funding and opportunities become available. Map showing locations of newly added outdoor Wi-Fi.